Contains lime flower extract which improves the hair structure and health, makes them shiny. All day-long hold. Provides volume and strength. This non-sticky hairspray is easy to comb out. Contains rose hip extract which strengthens the hair, improves hair elasticity and structure. This non-sticky hair mousse is easy to comb out. Contains calendula extract which protects skin against irritation. The skin-friendly formula eliminates unpleasant body odour, takes care of the skin and leaves you with a feeling of freshness. Deodorant is not sticky, quickly absorbed, leaving no white spots on skin or clothing. Contains rose hip extract which protects skin against irritation and have calming effect. The skin-friendly formula eliminates unpleasant body odour, takes care of the skin and leaves you with a feeling of freshness. 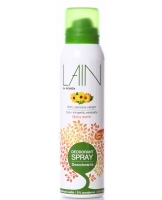 Contains oak bark and calendula extracts having disinfectant and anti- irritation activity. Contains oak bark and calendula extracts that provide skin hydration and soothes irritated skin. Contained extracts also has antiseptic properties. The well-balanced formula ensures excellent and comfortable shaving and protects skin from fine cuts and irritation.